The larger battery offers a 50% improvement in range. 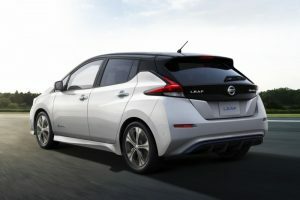 Perhaps the most important update for the new-generation LEAF is a 50% increase in electric range compared to the best that its predecessor could offer. Nissan says developments in electrode materials and battery chemistry have enabled the battery capacity to grow from 30kWh to 40kWh without changing its external dimensions. In turn, that provides a range of 235 miles (NEDC) to a full charge. It also offers better performance; power has increased from 109bhp to 148bhp, with an uplift in torque to match. Essentially, if the old car was roughly equivalent to a 1.6-litre diesel engine, the new one is more in line with 2.0-litre units. Charging times have increased slightly due to the larger-capacity battery, ranging from 16 hours on a standard 3kW (16-amp) unit, to an 80% recharge in 40 minutes on a rapid charger. The driving experience has been better tuned to motorway driving. External dimensions are almost unchanged, but the most radical update between generations is the design, now aligned with the likes of the Qashqai and Micra rather than the car it replaces. Within that same footprint, boot space has increased by almost a fifth as well as being re-shaped to offer a more uninterrupted load area. The outgoing LEAF’s loadspace had been compromised by the bulky on-board charger at launch, partially but not fully cured by the 2014 refresh. ProPilot driver assistance is available for the first time. 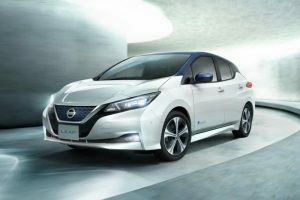 The LEAF gets Nissan’s latest driver assistance systems, some of which debuted on the updated Qashqai this summer. ProPilot offers active lane-keeping, speed and distance control between 19mph and 62mph on single-lane roads, and can bring the car to a full stop in traffic. 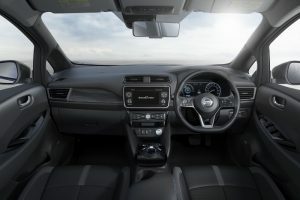 It also gets ProPilot Park, which can control steering, acceleration, braking and gear selection to manoeuvre into a space hands-free. Electric driving offers a few more benefits. All versions get the e-Pedal system, which enables a claimed 90% of driving to be carried out using just the throttle pedal. When fully released, this uses regenerative braking and the conventional brakes to bring the car to a full stop and hold it in position until the throttle is pressed again. The brake pedal is apparently only required for harsh braking.For more of the latest industry news click here.